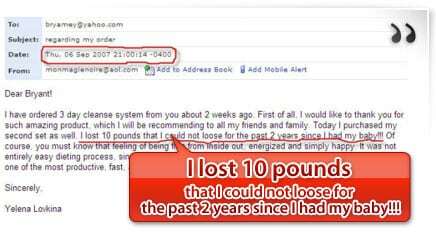 I have ordered 3-day cleanse system from you about 2 weeks ago. First of all, I would like to thank you for such amazing product, which I will recommending to all my friends and family. Today, I purchased my second set as well. I lost 10 pounds that i could not loose for the past 2 years since I had my baby!!! Of course, you must know the feeling of being free from inside out, energized and simply happy. It was not entirely easy dieting process, since I had to work, take care of the child, etc.. However, I believe that it was one of the most productive, fast and healthy cleansing experiences I ever heard of. Thank you!